The following website about Apotropaic Ethiopia, is a co-authored project by Vincent Reed and Charles E S Fairey, about Apotropaic Symbols and Protective Devices, as well as Witch Marks, which were found in the early Christian Churches of Ethiopia. It lists each protective device by type, with photographs, interpretation and wider meaning. In some of the examples, UK parallels have been used to compare and contrast, and show us the cultural and international use of symbols to 'ward off evil'. Some, especially the St Andrew's Cross or Saltire, have important historical ramifications about their actual origin, with this type, also being found in Ireland, stretching back to 3,200BC. It shows that this protective device has been used for at least 5,000 years, and is pre-Christian in origin, with artefacts from the Roman period also using this device to protect folk from evil. Grave Locations Direction: Churchyard: From South of Tower to East of Chancel. 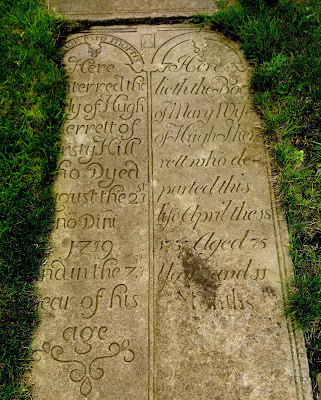 At St Bertoline's Church in the picturesque South Cheshire village of Barthomley, there are a number of Memento Mori graves. Memento Mori is imagery or text which reminds us all, that we shall die, so prepare for Death, in our lifetime. The following six gravestones depict symbols of death, and one even has a Memento Mori poem inscribed upon it. The graves are described and the inscriptions stated, along with the interpretation of the symbols below. St Michael’s Church in Garway, Herefordshire, was originally a Knights Templar Chapel with a defensive tower and preceptory. It was later taken over by the Knights Hospitaller who removed most of the circular Templar Nave and replaced it with a rectangular nave. However the Chancel and the ornately decorated Templar Chancel arch remained, with its own unique horned green man carving, to its left hand pillar capital. The Hospitallers also built a dovecote behind the preceptory, which was reputed to have 666 dove holes, before another doorway was inserted. The church hosts many odd and interesting symbols, many of which are linked to the Knights Templar, the Knights Hospitaller or the Freemasons. It is thought that the church site and Templar Complex was chosen due to the pre existing spring, which is still situated to the north-east of the church, dedicated to Saint Michael. For more articles on History & Mystery please also see Charles E S Fairey's Historian Website @ https://sites.google.com/site/charlesfaireyhistorian. Welcome to The Mystic Masque/Mask! We are Charlie and Mike from South Cheshire. We love researching everything historical, mystical and magical in our local and further surroundings. Our interests are numerous and varied, "We Hope To Leave No Stone Unturned, etc!"